Led and organized by Earth Mantra artist Mike Metlay, Different Skies is an annual electronic space music festival, a workshop for artists in these and related experimental music genres, a working vacation, an intensive and rewarding creative environment, and many more things. Mike began Different Skies in 2003 with the assistance of Tucson musician and radio show host Doug Wellington, as an opportunity that rarely presents itself in the rarefied world of space music: a chance for members of our community to get together for an extended period of time in a controlled and isolated environment, to network and learn from one another, form new professional alliances and new friendships, and to create and perform an evening of entirely original new music for an enthusiastic audience. Electronic music, which features the synthesizer and computer as prominently as it does traditional amplified and acoustic instruments, is traditionally viewed as a lonely art form, created by musicians working alone in small studios. Opportunities to build community among these musicians are few and far between. A big challenge was to find a place which was inspiring and welcoming to visiting musicians, where rehearsals could be both relaxed and energetic, with a fixed goal in mind while allowing for flexibility of scheduling on a day to day basis. Arcosanti, with its wonderful admixture of futuristic architecture and art-colony sensibility, has been a perfect choice, in no small part due to the welcoming and supportive nature of the Arcosanti community. 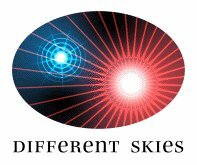 Different Skies is an exceptional experience for all concerned. Different Skies happens every year, with artists old and new, a new palette of ideas, and a lot of energy and drive to create beauty for the listener. Earth Mantra is proud to bring its listeners the music of this totally unique electronic music festival.